Tea etiquette and events are gaining popularity in the United States, but some of us need a little guidance in what we're doing. Dressing for tea is relatively new to Americans outside of the American south or the American east coast. The original English colonies found in the eastern and southern United States are more familiar and comfortable with the idea of “taking tea” as an event, a social gathering, or as a party and generally have an inkling of what's expected in regards to attire. Unfortunately, taking tea has taken on some confusing interpretations in the United States which has impacted how we dress to take tea. As celebrity culture and “reality television” grow in popularity in the U.S., many viewers are looking to this newly anointed pseudo-aristocracy as the arbiters of etiquette –including the etiquette of “taking tea” and dressing for such. As I mention in my post “High Tea is Not What You Think…,” individuals unfamiliar with tea taking confuse “high tea” with “afternoon tea.” This confusion in tea events is only exaggerated by reality shows that portray seemingly wealthy women throwing lavish “high tea” parties, including the obnoxiously excessive accoutrements that accompany the confusion. For this post, I'll focus on social tea events and tea events at higher end tea rooms and hotels. What most people associate with “high tea” is Afternoon Tea which commonly occurs from 2 o’clock to 5 o’clock in the afternoon. Afternoon Tea can be something as simple as a Cream Tea (primarily tea accompanied by scones with clotted cream and jam) to a more elaborate Royal Tea which serves champagne and/or sherry and includes an elaborate salad with sweets and sandwiches. High Tea is less formal and closer to a supper that includes tea. It’s also called a “meat tea” because meat, savory items, and heartier fare were included in the tea. The occasion falls in line with whether it's afternoon tea or high tea, or even Elevensies (that's for another post). Since a tea party is a more social occasion involving a group of invited guests, the host can provide the dress code. For all teas, however, throw the stereotypes out of the window. Do not put your pinky finger “up”! It’s an affectation that has no place at a tea. It’s almost seen as a mocking of the tradition of taking tea. Keep those pinkies down…please. A hat is not required, unless the host suggests it as a dress attire. Keep the fascinators –which are not hats(! )—and outrageous hats at home unless the host suggests it. Hats were originally a part of the occasion because women wore hats and gloves in public and if one were invited to a tea, then one would be wearing both when they arrived, but they would remove their gloves for tea. It’s the twenty first century and women are not required to wear hats and gloves in public. If you are invited to a royal tea or to a tea with a public official or to a public social tea, then keep the hat and gloves understated, fashionable, matching, and tasteful. Save the outrageous hats for Ascot (outside of the Royal Enclosure) or the Kentucky Derby…unless your host requests it. A dress is not required. Again, this is the 21st century. Women are not relegated to only dresses. Fashionable and tasteful suits, slacks, blouses, and jumpsuits can be equally elegant. Just because someone lives in the American south and invites you to a tea event it does not mean that they want you to dress like Scarlett O’Hara in “Gone with the Wind”! The over-the-top Chantilly lace, hoop skirts, and “fiddley-dee” ruffles do not automatically equate to the south. Many in the south still adhere to feminine aesthetics in clothing, but also many established events are very contemporary and would look at you askance if you reverted to a dress stereotype. A fail-safe is to ask your host or the sponsoring individual/group about the attire or look at photos from past events. This is not the time to “shock and awe” your host, unless that is what they’re requesting. The best dress code for everyone is to be neat, clean, and smartly dressed in items that fit well, are not too revealing or too tight, are well made, and reflect the color of the festive occasion or season. 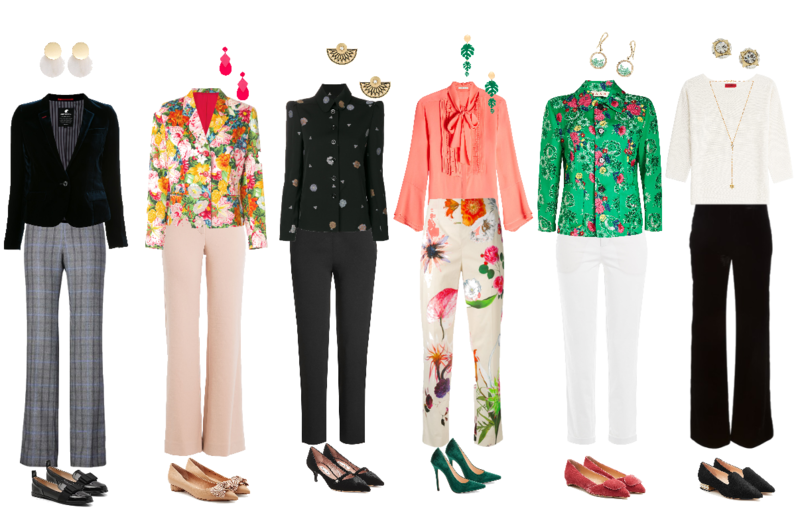 Tailored slacks or dark denim with dark threading, blazers, suiting, full length or mid-length jumpsuits, mid-calf or knee length dress, and enclosed flats, pumps, heels or enclosed shoes with no shoelace holes. Button-down shirts, sports jackets/blazers and slacks. Full-length tailored slacks, blazers, suiting, full-length jumpsuits, no “spaghetti straps,” no “strapless” dresses or tops without a covering like a cardigan or blazer, dress flats or mid- or high heels, pumps, and button-down blouse/shirt. Business casual or dressing with full-length slacks or jumpsuits and covered arms, blazers, and enclosed shoes. Since High Tea occurs after 5:00 p.m., your clothing should accommodate for cooler evenings. If you plan to just pop in to your local tea room to meet friends, consider the tea rooms dress policy, if there even is one. The hard and fast rules are no athletic shoes, no yoga pants, and no revealing tops or over exposure. Save your "flop around" clothes for errands, the beach, and more low key activities. Again, if you're unsure, just ask your host!